Logan, is a regular high school guy who is working on getting over a girl who he dated for three years. One day, Sage, a new girl, shows up in biology class. Logan is instantly taken by her, and it seems the she likes him back. He gets mixed messages from Sage. Sometimes she seems really attracted to Logan, and other times she says that she is not allowed to date. She says that she was home-schooled for a few years. Logan is respectful of all of that, but he wonders why Sage’s younger sister was not home-schooled and is allowed to date. As he discovers Sage’s secret, Logan is forced to decide how much he cares about Sage, and how much he cares about what others think. I was expecting a “girl book” because of the cover, but I found a rich, story with a dynamic male protagonist. 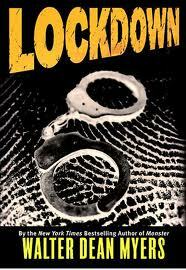 Once I got into the story, I could not put the book down. Reese is in a juvenile detention center, serving time for stealing prescription pads. Regardless of his best efforts to keep his nose clean, Reese gets in several fights, and keeps losing privileges while he is locked up. Fortunately, he participates in a work program, so he gets to work at a home for Senior Citizens. Reese is assigned to work with the difficult, angry Mr. Hooft. At first, Reese finds Mr. Reese as intolerable as everybody else does. As he continues to work with him, however, they learn a bit from each other. Sophie gets angry when her sister snatches her toys. At first, she starts to explode, but then she runs and runs and finds something beautiful to help her calm down. 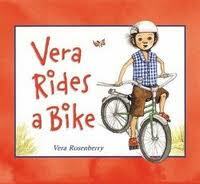 When Vera’s bright red tricycle disappears, she get Elaine’s hand-me-down bike. The riding it part isn;t that difficult, but stopping causes some problems for Vera. 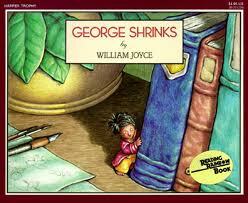 While his parents are away, George experiences the day as a teeny-tiny boy. He accomplishes everything that his parents asked him to do, just from a different perspective. The fun illustrations add so much to this story. 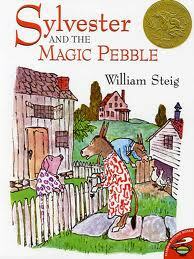 Sylvester, who has collection of pebbles, comes across a very special pebble. It has the power to makes Sylvester’s wishes come true. Unfortunately, Sylvester makes a wish that seems like the right thing for the moment, but its effects are long-lasting.